Originality - Must be an original work by the author and not a reprint, rewrite, or translation of an article from another domestic or foreign source. Relativity - Must relate to military postal history and not merely be an article on some aspect of military history by itself. Significance - Must contribute in a positive manner to the military postal history field. Should contain information that either adds to or in some manner increases our knowledge in the subject of the article. May be of a type that a reader could use as a reference. Accuracy - In the judgment of the committee, the content must be accurate. Content/Style - The article should read well, be grammatically correct, and be clear in intent and meaning to the reader. References/Sources - Where applicable, should list the references and sources used by the author. May not be applicable in all cases. The award committee is appointed by the MPHS President. The award, a suitable plaque, is announced at the convention in the calendar year following the publication of the article. Presented to Roger Callens for his Christmas Miracle on the Western Front. Harvey M. Karlen was chosen to receive the 2009 best Article Award for A Civil War Soldier's Letter Prompts Research. 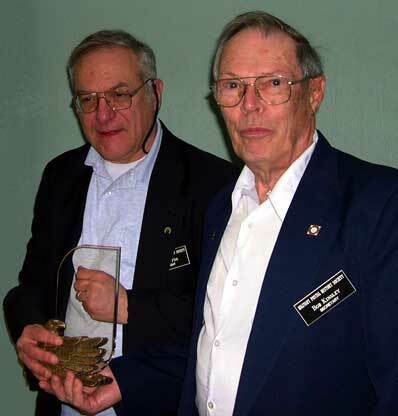 Louis Fiset received the society's Best Article Award for his contribution in the Summer 2005 issue of the Military Postal History Society Bulletin. Fiset's article, "Diplomatic Exchange Voyages of World War II" describes the service provided by the ships S.S. Drottningholm and M.S. Gripsholm in exchanging groups of foreign nationals who suddenly found themselves to be "enemy aliens" as a result of the declarations of war in WW II. These vessels returned U.S. nationals living abroad in exchange for diplomats and other citizens of Axis countries who were in formerly friendly countries. Author Fiset details the process of exchanges and lists the dates of the vessel sailings and their ports of departure and arrival. Examples of mail associated with these exchanges help tell the story. Kinsley, who is the society's Secretary, published three articles in the 2004 issues of the society's Bulletin. "Operation Overlord" in the spring issue retold the story of U.S. troops landing at Normandy in World War II including the diversionary tactics in southwest England. Photos of the troop landings illustrate the article. In the summer issue the author describes a censored cover as evidence of the important mission of Belgian Congo troops in supporting the British in Sudan to defeat the Italian army in Ethiopia. It was sent to the Red Cross in Geneva and bears military and civil censorship markings. Kinsley's third article appeared in the fall issue under the title of "Custer's Last Stand." He shows two covers from Fort Custer, Montana. The fort was built the year following the famous battle.